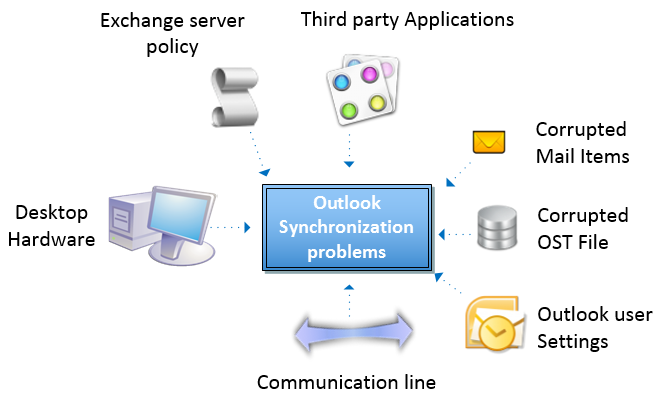 How to Solve OST File Synchronization Issue with Exchange Server Mailbox? While working with Outlook email client and Exchange server, OST files acts as the key entity. OST files are used to store mailbox data and keep it synchronized with the Exchange database. It allows users to access mailbox data when connection to the Exchange Server is not available. As soon as the connection to the Exchange is established, the content and the changes made to the OST files are automatically synchronized with MS Exchange. One can compose and save emails while working in offline mode. The emails which need to be send are stored in outbox and once the connection is established the mails are send to the destination. When the OST file is synchronized with the Exchange server, the changes made in the OST files can be viewed on the Exchange Server. On working with the OST files, its size continuously increases. When size of the OST file approaches to the maximum limit, some irregularities in the behavior of the OST files are noted. Some of them are: OST files are not opened or loaded, new data cannot be added to the OST file, mail operations cannot be performed, synchronization with the Exchange server is not done and a large number of error messages are displayed on the screen. In the beginning, increased OST file size leads to issues with the daily operation on mails like sending, receiving and composing mails but later serious issues like data loss and corruption may occur. However, in order to avoid mailbox size issues, one needs to keep a check on the size of the OST files so that it can be prevented from getting oversized. There are some factors like bad sectors on the local hard disk drive, Antivirus and a large number of unknown reasons which damages the OST files. If some corrupted mails are present then there is no simple method to locate them. They can be located by "Divide and Conquer". Using Divide and Conquer, couple of folders is created and the mail items are spread between these folders. It is then noted that which folders are synchronized successfully and which are not. The unsynchronized folders include the problematic mails which stops synchronization process. Exchange or Outlook can accommodate a maximum of 100,000 mail items in a single folder. But in normal day to day practice, it is advised to keep a range of 2,500 to 5,000 mail items in a single folder for the proper functioning of the Outlook. Moreover, it is recommended to use "3-Level" folder hierarchy. Failure of synchronization process frequently – The synchronization process can be completed successfully sometimes and at many times it stacks. NOTE: - Stacking of the synchronization process is observed when the communication line is overloaded. Slow synchronization process- Sometimes the synchronization process succeeds but its rate is quite slow. This issue arises when the communication line is not wide or there is some issues related to the hardware. Determine Whether OST Is Synchronized Or Not? Right click on the folder that is to be verified. Go to synchronization tab which contain OST synchronization information. Note:- if synchronization tab option is not present, it implies that one has not set the profile to use offline folders. Go to Tools and select E- Mail account. Go to deliver new mail to the following location list option and select mailbox- account name. Select Microsoft Exchange Server and then click on change. Confirm for the selection of the Use Cached Exchange mode option and then click on next. Click Finish and then OK. In the Tools menu click on account settings. Click on Data Files tab and be sure that Mailbox-account name is set as default. Now, click on email tab. Click on Mailbox account name and then click on settings. Confirm that Use Cached Exchange Mode is selected and then click on OK.
Close the account setting dialog box. In the file menu, click on the Account setting and then select account setting. Click on data files and ensure that Mailbox- account name is set as default. Click on Mailbox – account name and then click change. Ensure that the Use Cached Exchange Mode option is selected and then click on OK.
Click on GO and open folder list pane. Select offline file folders from the list. Go to Tools and click on send/receive. Select Send/receive all in order to synchronize all folders. Note:- Synchronization of only one folder can be done by selecting 'This folder (Microsoft Exchange server)' option. Go to Tools and click on options. Select Mail Setup and in the Tab go to Send/receive section from there select the checkbox 'send immediately when connected'. Click on Send/receive option for opening send/receive dialog box. Select the option Perform an automatic send/receive and click on close. If the above mention steps don't provide fruitful result then one can recreate a new OST file and then synchronize it with the Exchange. Search for the OST file. Rename the OST file extension. Go to Tools and select send/receive. Using these steps one can automatically create new OST files and synchronize it with Exchange. If the OST file is not synchronized with the Exchange Server Mailbox then one can opt for the commercial solution for "OST to PST Converter". It recovers inaccessible OST files and converts it into PST, EML and MSG format. The software provides multiple naming options and maintains both folder structure and Meta data. Cannot Open Your Default Email Folders, how to fix it? How to Repair Corrupted Offline Outlook OST file? How to Deal with Offline Exchange OST File? How to Move Outlook emails into PDF format?